So-called “soft skills” are important for success in the labor market, and in life, as work by scholars such as Jim Heckman and Angela Duckworth demonstrates. Our behavior and personality matter. These skills or traits are not fixed, but are at least to some extent malleable. Improvements in child personality traits and behaviors have positive long-run implications for educational attainment and success in the labor market. But on average, children in poorer households are less likely to develop non-cognitive skills, contributing to intergenerational inequality. In particular, adverse experiences in childhood damage the development of these skills. A range of policy interventions, from parenting programs through early years education to “no-excuses” charter schools, are aimed at bolstering skill development and improving behavior (Ludwig and Miller, 2007; Heckman et al 2010; Heckman et al, 2013; and Chetty et al, 2011). But there may be a simpler way to help children in poor families develop these skills: make their families less poor. 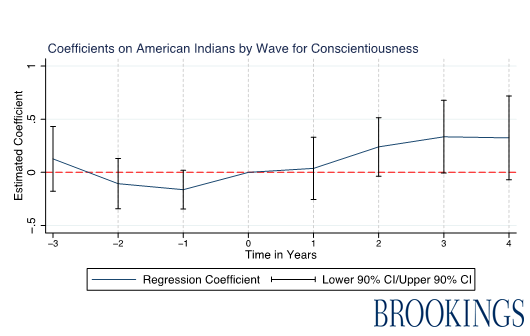 In a new study published in the American Economic Review, my co-authors and I examine the impact of a boost in household incomes on child personality traits and behavioral or emotional disorder symptoms. We find that money matters. Our study examines the influence of a direct, ongoing governmental transfer of around $5,800 per year (in current dollars) to families in the Eastern Band of the Cherokee Indians reservation in North Carolina in the mid-1990s. The funds represent a share of the revenues of casino operations on the reservation. Our control group consists of non-American Indian children from adjacent counties as well as American Indian children who were treated to the transfer during late adolescence. Our outcome measures are derived from the Great Smoky Mountain Survey (GSMS), which is based on interviews with both American Indian and non-Indian children and their parents for three cohorts of children from 11 counties in the western part of the North Carolina, including the reservation. The GSMS follows children into adolescence and adulthood. Specifically, we track clinically-validated DSM IV measures for emotional and behavioral disorder symptoms (eg. when a child is described as angry, argues, easily annoyed, disobedient, spiteful, or losing their temper easily) as well as an index-based measure for personality traits of conscientiousness, agreeableness and neuroticism. There are similar results for the other outcome measures of interest as described in the main paper. Who does the money help most? 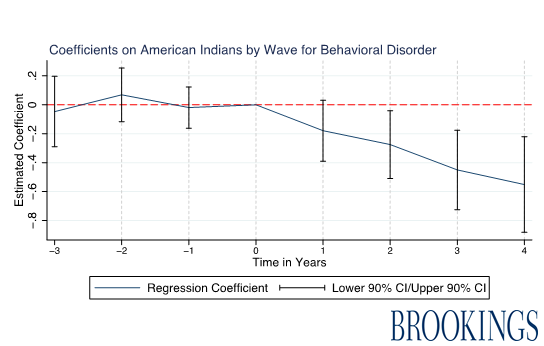 One might imagine that this income intervention may just improve conditions for those with only mild behavioral problems. However, we find the opposite. The income boost had the biggest impact on the children who started off with the greatest problem in terms of behavior or conscientiousness. Why does money help? This is hard to answer. There was no apparent impact on parental employment; and we are unable to measure whether spending patterns changed, for example to provide extra educational resources. It seems likely that part of the story is a reduction in parental financial uncertainty and stress. The income boost is permanent, and the equivalent to approximately 20-25 percent of the pre-intervention household incomes. Less stressed parents may make better decisions or be less mentally-fatigued, and with the mental energy required to be more engaged parents (Mullainathan and Shafir, 2014, Scarcity). The precise causal pathways are necessarily hard to identify. But our results are clear. More money in family budgets can improve child behavior and personality traits – and likely better long-run outcomes, too. Are we reducing hunger in the world?